This Wednesday, we went to Bistro Sakana in Yaletown for their Taste of Yaletown menu. It was, as always at Bistro Sakana, amazing. One of the nice things about Bistro Sakana is that it’s fairly reasonably priced for consistently amazing sushi. There’s a lot of attention put into the food and it’s always a fun night out. We didn’t think that we’d have enough to eat – small portions and all, but the soup was filling and the food was a nice variety of flavours. As an aside, we’ve decided we have to go back and just order Teppan roll in future. Yellowtail sashimi, layered with pink grapefruit sections, soy-balsamic vinaigrette. I’m not normally a fan of hamachi, but the citrus and ginger balanced the flavour of the fish. This is going to be a long one, so I’ll employ the use of the “Read More” in a few minutes. 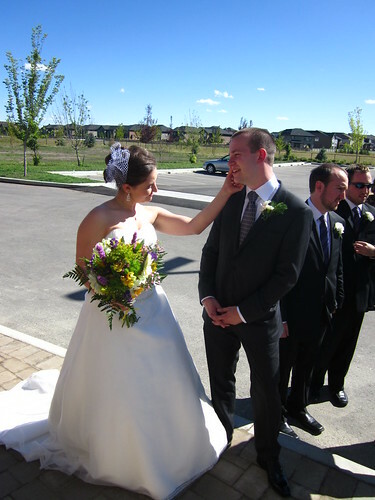 Firstly: My cousin L. got married on Sept. 3! So I went to Calgary with the entire family (mother’s side) for the Event. My brother and I flew out to Calgary on Thursday. The family (sans the wedding party) went to Banff (BAMF!) on Friday for a tour around down and up to the Gondola, then back for a family dinner. I won $140 at the casino. Post-wedding open house (and the associated games) on Sunday rocked. I got about 7 hours of sleep all weekend. And was a zombie all Monday.